Courtesy of Ornamentea, here's a super simple Sparkle and Stack Ring tutorial. I'm not normally one for sparkles, but I found this tutorial on Pinterest right after I received an assortment of Swarovski crystal cup chain. Perfect timing! The ring above follows the tutorial very closely. The only difference is that I didn't use the 26g wire to wrap over the ends of the wire ring shank. Instead, I smoothed the cut ends on the band with my cup burr and made sure they lay flat. 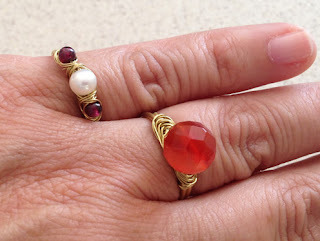 I made several of these rings. 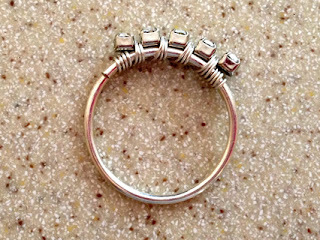 Below is the ring shank before wrapping any embellishment on. 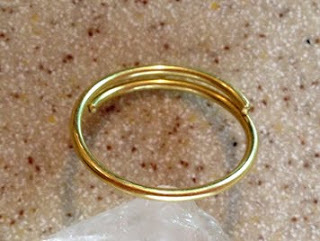 The ring shank is 16g or 18g wire, silver filled for the cup chain ring and yellow brass for the 'gold-tone' rings. 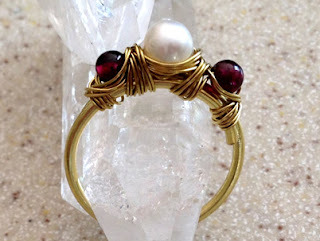 The way that I made this ring - an important element for the comfort is the amount of overlap of the ring shank wires. I tried to make it so the cut ends tuck right between my fingers. They are smoothed with a cup burr and emery board file, so there are no sharp ends to catch on my fingers and they can't get caught on anything else like my clothing. I am very pleased with the way this works out. This ring has a 6mm white freshwater pearl in the center and 4mm round garnets on the side. I was aiming for an 'ancient' regal look. From the side view, notice that the wires that attach the beads in my version end before the shank wires. I like that this minimizes the likelihood of the wrap wires loosening by slipping off the shank. Oh, I should mention that no matter how hard I pressed the wrap wires around the shank, they could still slide around - so I cheated and put a little crazy glue gel to keep them in place. Whatever works! 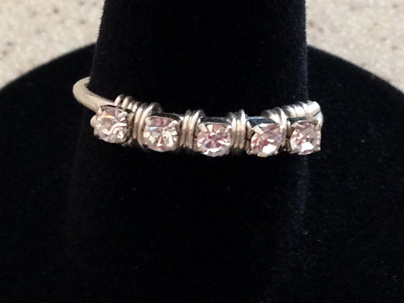 Obviously, I had a good time trying different variations of this ring. 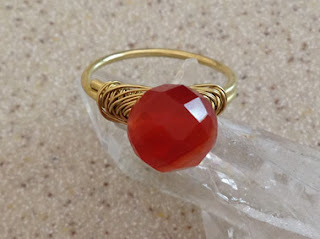 The shank is super easy to make and is suitable for lots of different styles of embellishment, from cup chain, to a single stone to multiple stones. 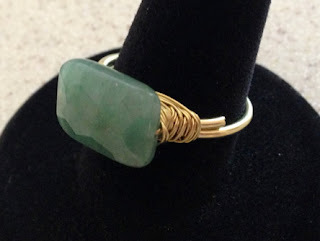 For the wrap wire, I sometimes used two pieces of wire together, if the hole in the stone was large enough. I felt like that gave the wraps more strength without making it harder to wrap. I hope you have as much fun with this ring design as I did!